We’ve got some cool new plants around the nursery, and all the tropicals are growing like mad from the warm and humid weather we’ve been having. 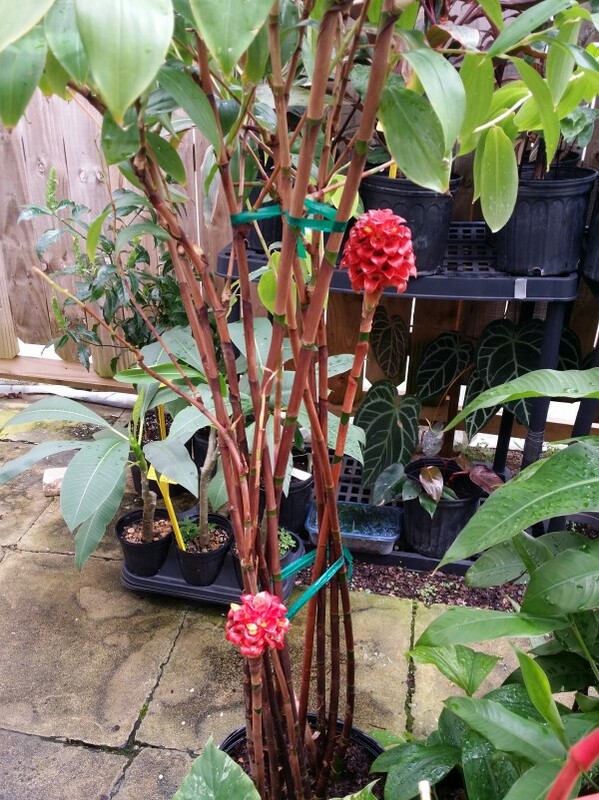 Blooming Indonesian Wax Ginger (Tapeinochilos ananassae) in 7 gallon pots. 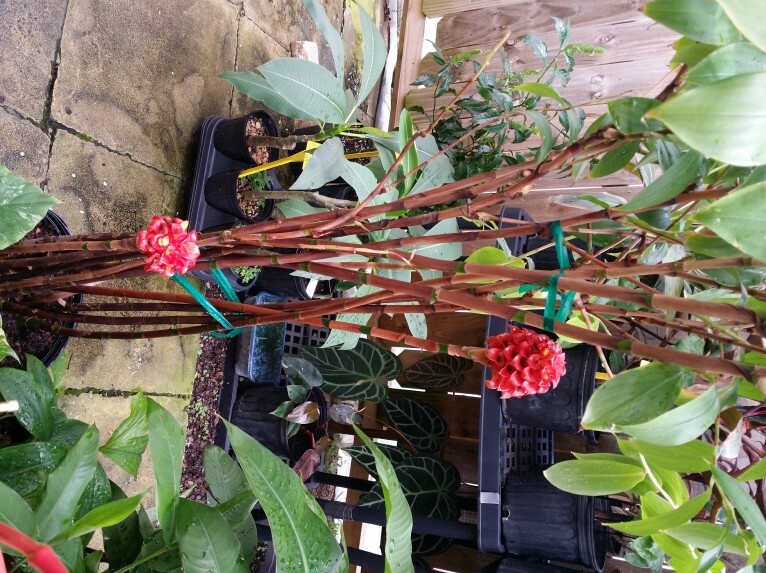 Plenty of spiraling green ginger foliage on tall red stalks. Established clumps bloom like crazy in the warm season. Likes plenty of water and bright part to almost full sun. Variegated Dwarf Alocasia gageana – a great dependable grower- part sun to almost full. 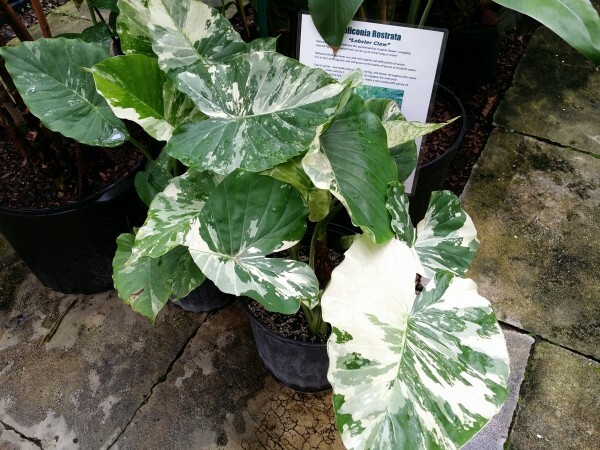 Spreads and holds its variegation well- leaves up to dinner plate+ size. Rare! 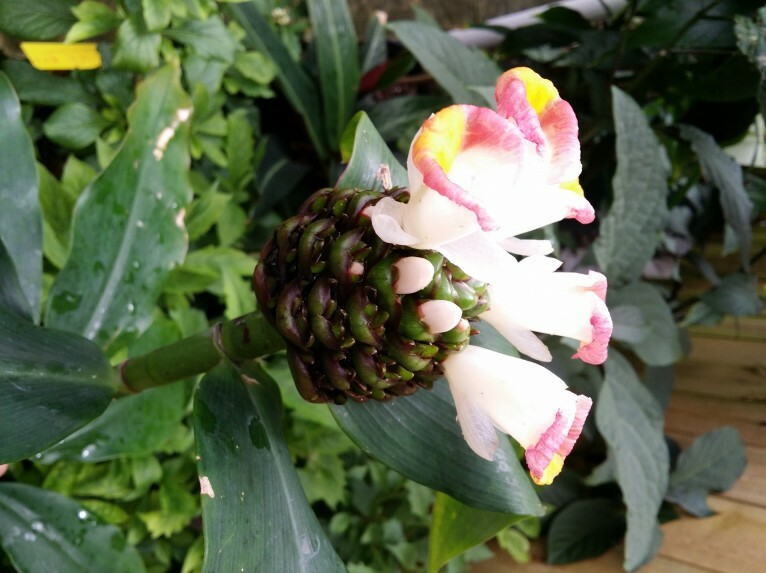 Another beautiful variegated plant- this is Variegated Crepe ginger – Costus speciosus Variegatus. 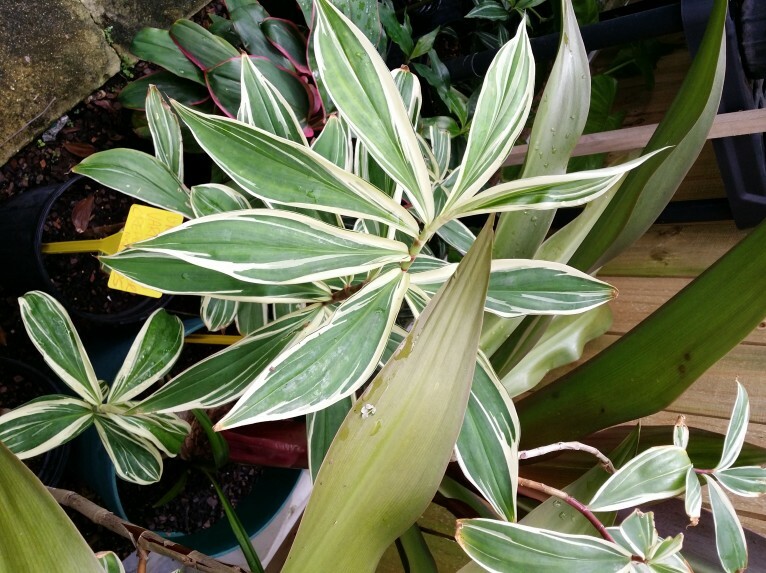 Spiraling red stalks with green and white foliage. 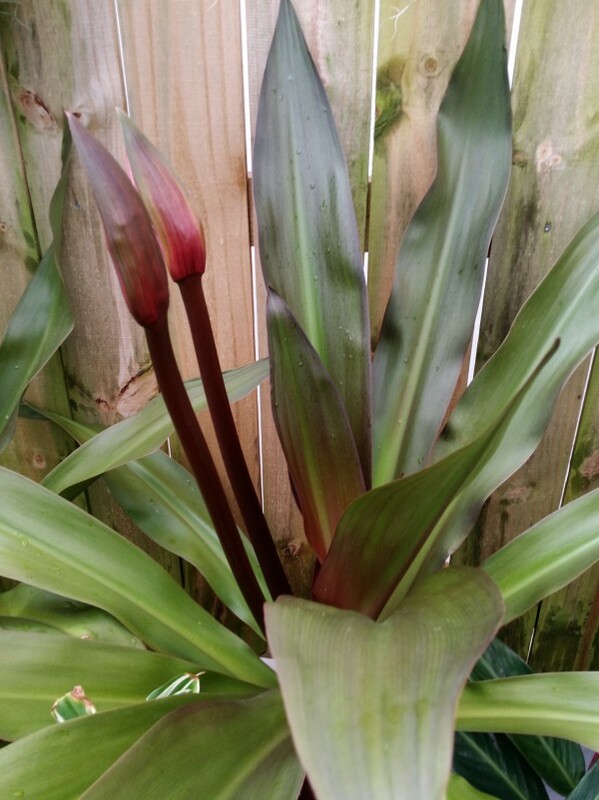 Blooms on the tip with a large maroon/purple cone from which white flowers emerge. New shoots grow from the underground rhizome. A rarity for your jungle landscape- in limited supply. 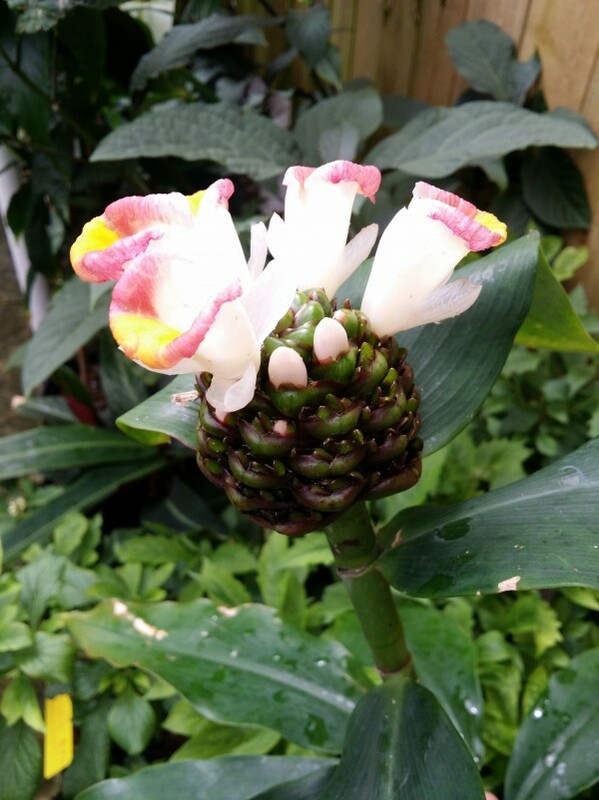 Another ginger with a large cone flower, this is Costus lucanusianus ‘Cameroon Queen’. 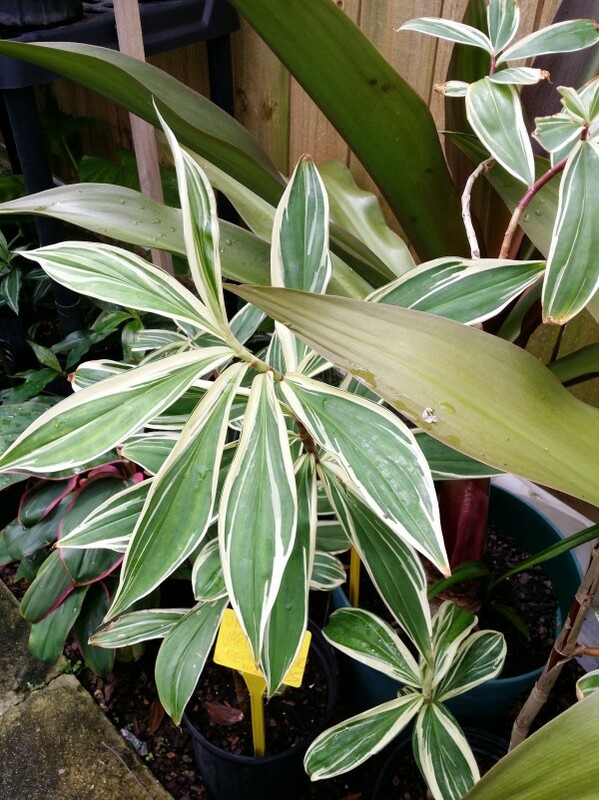 An excellent choice for those seeking a bamboo-like look near a pool or other area where leaf drop is to be avoided. 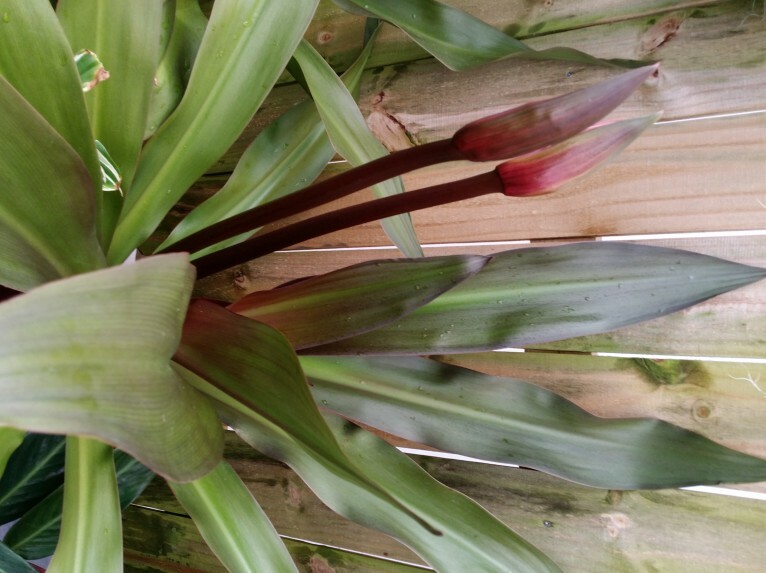 Grows to about 5 to 8 feet tall, the lower portion of the mostly straight stalks stay leafless, showing off the smooth segments with red spatter pattern and looking quite a bit like a bamboo- but then comes the amazing flowers at the end of each stalk! Rare and very cool- plus not hard to grow! Likes part to full sun. 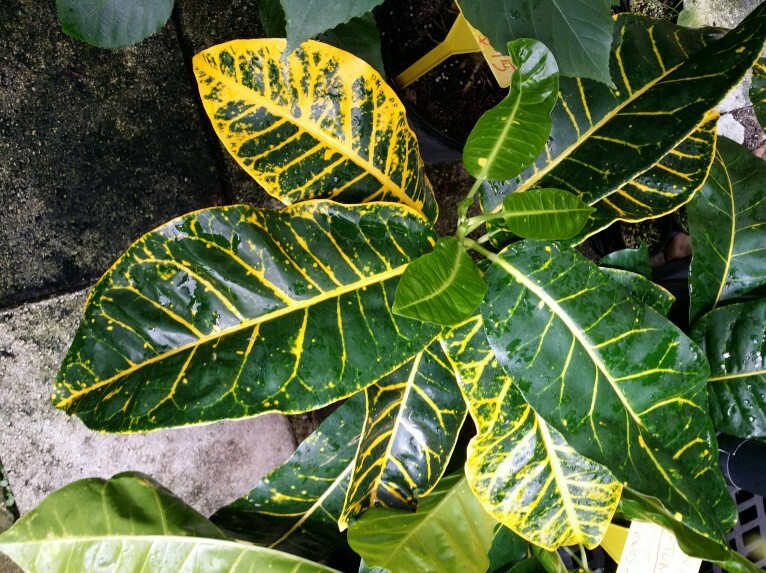 This interesting croton is unique in that it has very large and wide paddle leaves. 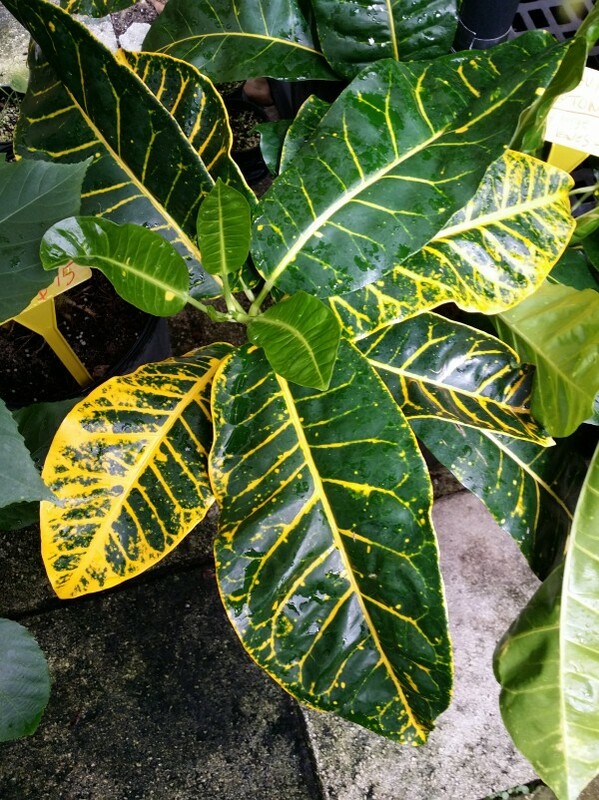 The leaves are thick and heavy- sometimes becoming almost completely bright yellow. I use these leaves in flower arrangements often due to their huge size. 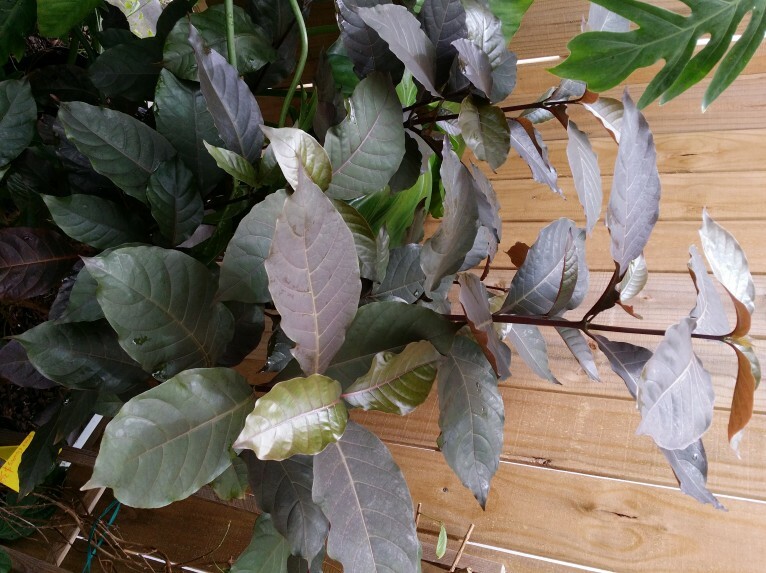 The very cool dark colored ‘Bronze Leaf’ – this plant grows much like the Copper Leaf, but has dark bronze to almost black foliage. A unique look that is very different.. great for covering up fences or equipment. 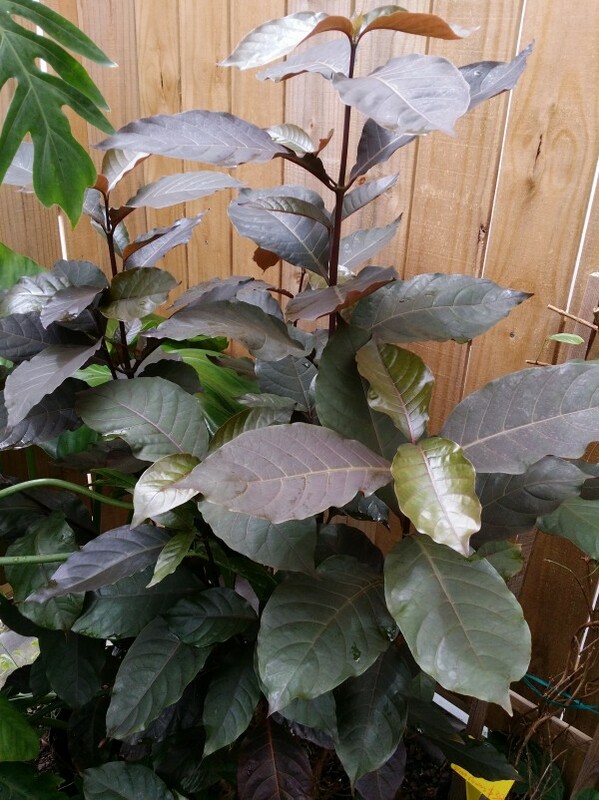 Grows in part to full sun, -can get as tall as you like, just hedge back as needed.